With such rapid technological progress in recent years, the way we live, work and balance our professional and private lives has transformed tremendously. With millions of people around the world these days conducting their professional lives in a freelance capacity, working at home has never been more prevalent. Even for those who work a traditional 40-hour work week in a designated workspace, it's become a crucial and indispensable necessity of modern life to have a space in the home that you can comfortably call an 'office'. The fact is, not everyone has the luxury of abundant space to work with in order to be able to incorporate a fully purpose-built office room into their homes. Thankfully, with a little know-how, you can turn almost any room or nook in the home into a fully functional, multi-purpose office space without much hassle at all. 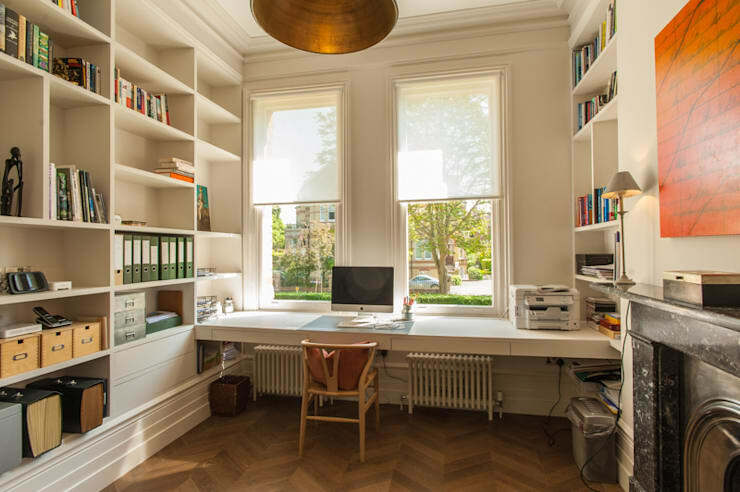 Today on homify, we’re taking a look at some fantastic tips on how to effortlessly incorporate an office into your home, whether spacious or small, compact or tall. Read on, and enjoy a little inspiration on how to get your home office up and running, or working even more smoothly. Despite how commonplace home offices have become these days, we often still think of them in a traditional sense: as entire rooms, separate from the rest of our living quarters. Not all of us have the luxury of space in our homes, so we can't all dedicate an entire room for an office. The simple fact is, you don't need to: with the right choice of a single unit of shelving, you can create a fabulous workspace more or less anywhere in the home that you’d like. Take this neat example: here we have a fabulously modern, yet casual workspace that can’t help but induce productivity. 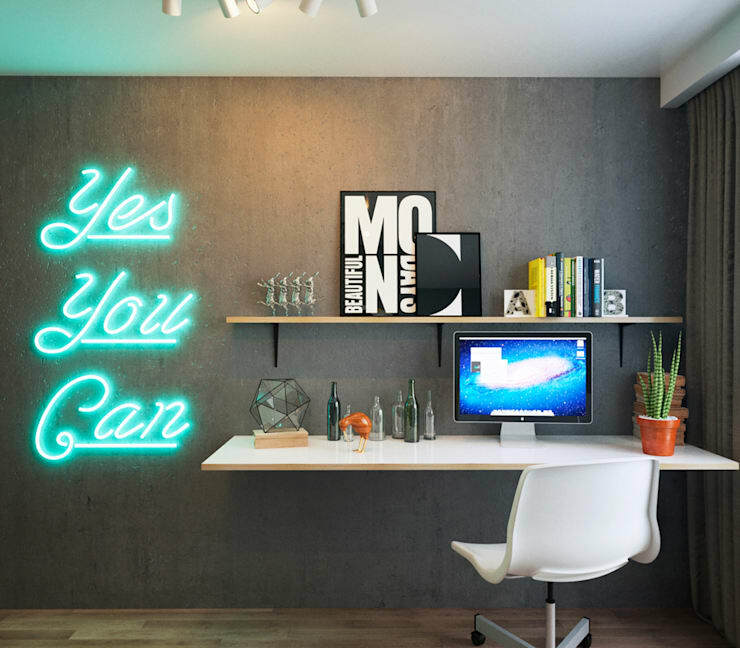 Modern wood floorboards meet sleek grey-tone, with a fabulous feature neon wall fixture that doubles as a motivational affirmation. But to turn this room from a generic domestic living nook into a fully functional office space, all that was really needed was this two-tiered bench unit affixed to the main wall: one to function as a primary computer desk, the other for auxiliary work items, books and decorations. Tastefully down-lit with ceiling halogen, this is a truly simple home workspace where things can’t help but get done, and done on time. You know, it’s worth reminding that it can be a rather tricky task to set up your own home office; even with these tips, it’s always a good idea to chat to a professional for a little extra advice. So, supposing you’ve got yourself a fine looking desk and some additional office-related furniture ready for the installation, but the space you’ve chosen for your new home office isn’t really cutting it for the purpose. Perhaps the desk is stuck all the way in the corner, or a dull wall where inspirational flow is proving to be virtually non-existent. If you happen to blessed with a slightly larger space in this instance, consider playing around with your furniture configuration. Sometimes, all you need to do to turn an inspiring ‘room with a desk’ into a fully functional, professional-standard home office is by pushing away from the walls altogether. In this neat example, a basic, open plan domestic space is given totally fresh life as a designated professional workstation almost entirely thanks to the artful placement of the desk in the centre of the room. With books and crucial tools of the trade right behind you, and nothing but free, open space all around you, inspiration and flow can’t help but be attracted. A simple, professional touch for a simple, professional home office. Perhaps you’re the type of worker who works from home but also really craves a little separation between your work and domestic settings. Have you ever considered taking the office out back? If you happen to have access to an outdoor space or garden nook, or perhaps even a disused shed or garage, you might just have the perfect solution to your home office needs. 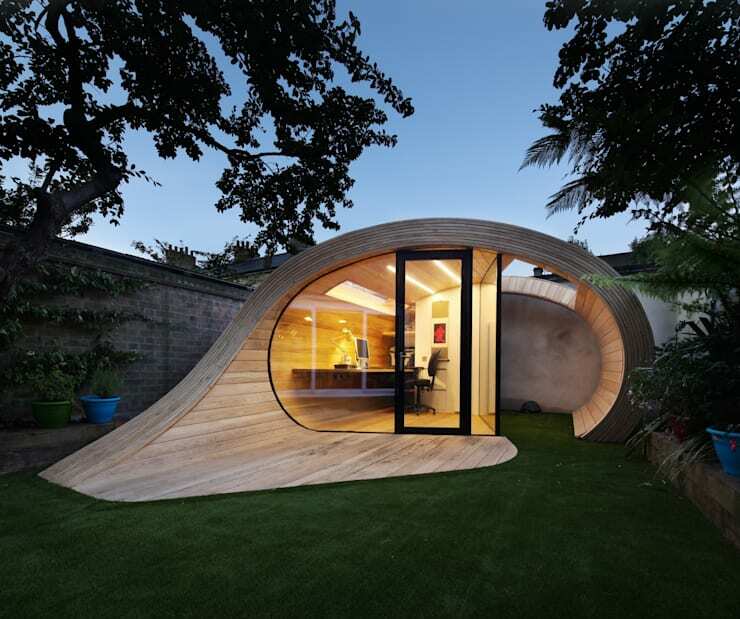 Here’s a little home office candy to get you really inspired: a truly fantastic timber plywood clad rear yard office space. Sure, this is a dazzling space, and it might not suit everyone but it’s certainly an idea of what can be achieved. Even the most basic summer house or bungalow construction could be the answer you’ve been looking for. When setting up a home office, one of the most important things to consider is the usability of the space. It’s all well and good to set up an adjunct workspace in a multi-purpose, open plan setting such as a bedroom or living room, but there’s little point unless it’s conducive to actual work. Don’t have the luxury of dedicating an entire room for an office area? Not a big fan of fusing spaces for cross-purposes? As long as you’re not too concerned about how large the area is, there’s a good chance you’ve got a perfectly sufficient nook somewhere in your house for a neat office workstation. Perhaps along a walkway or corridor, in between the bedroom and bathroom, a nook up on the mezzanine or even under the stairs. Here is an excellent example of how you can turn even the most basic, mundane and seemingly purposeless interior nook into a fabulously functional office space: just add custom-sized desk, inspiring wall paper and curios, a laptop and a comfortable chair, and you’re well on your way. Are you the sort of person who likes to work on multiple tasks at home at once? Perhaps the concept of trying to get everything done while isolated from the rest of the home really doesn’t appeal so much. If you’re a natural multi-tasker who simply can't get anything done without having the TV on in the background and the stereo blaring from the kitchen, then a natural multi-tasking space is probably where you need to set up your home office. Take this space as your cue: a brilliant, contemporary all-in-one living room, dining room, entertainment room and, if you happen to desire it, a fully functional home office space in order to get it all done in style. Did you enjoy that Ideabook? Why not get even more inspired with a look at The perfect home office? Do you have any other handy home office tips for our readers? We’d love to hear from you in the comments section below!